Species 2, in the north temperate zones of both continents. Type species: Arundo festucacea Willd. Arundo festucacea Willd. Enum. 1: 126. 1809. S. festucacea Link, Hort. Berol. 1: 137. 1827. Graphephorum festucaceum A. Gray, Ann. Bot. Soc. Can. 1: 57. 1861. Culms 3°-5° tall, erect, smooth and glabrous. 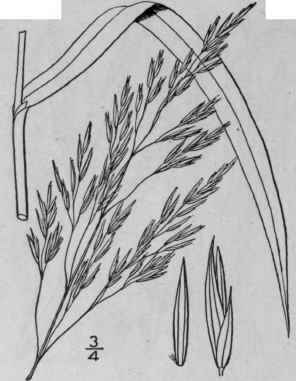 Sheaths often overlapping; ligule 1"-2" long; blades 7'-1° long or more, 2"-4" wide, flat, scabrous on the margins; panicle 8'-12' in length, usually open, the branches ascending, naked at the base, the lower 3'-4' long; spikelets 3"-4" long; empty basal scales acute, the first shorter than the second; flowering scales scabrous, 7-nerved. Wet places, Iowa and Nebraska, north to Manitoba and Saskatchewan. July-Aug.